The Mars Society is pleased to announce that another chapter has been added to the growing ranks of its world-wide network dedicated to the cause of humans to Mars. Late last week, a group of university students belonging to the Engineering Students Association of Bangladesh (ESAB) held an inaugural meeting of the Bangladeshi chapter of the Mars Society at the U.S. Embassy in Dhaka, the country’s capital. The U.S. Embassy organized a reception to host the new international Mars Society chapter and also to welcome home the three Bangladeshi student teams that participated in the Mars Society’s 2016 University Rover Challenge (URC) held at the Mars Desert Research Station in Utah this past June. 40 students who participated in the URC were welcomed to the meeting by U.S. Ambassador Marcia Bernicat and Md. Arif Raihan Maahi, Executive Director of the ESAB Innovation Center and the new President of Mars Society Bangladesh. 20 of the students signed up to serve as the core membership of the newly-founded chapter. 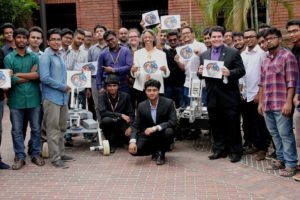 The three participating URC teams from Bangladesh - AIUC Robotic Crew, BUET Rover Team and IUT Mars Rover - brought along their rovers to the embassy gathering and also talked about the challenges they faced during the highly-competitive Utah rover contest.